A new study describes how diverse marine organisms are susceptible to diseases made worse by warming oceans. The research warns that warm sea temperatures in 2015 may increase the levels of epizootic shell disease in American lobster in the northern Gulf of Maine in 2016. The panel starts with photo A) Healthy ochre star populations before an epidemic in Bamfield, British Columbia, Canada. Photos B-E reveal progressive signs of disease, starting with B) initial sign of disease is arm twisting; C) appearance of small lesions in the body wall; D) loss of arms; E) complete break down of all arms from body. 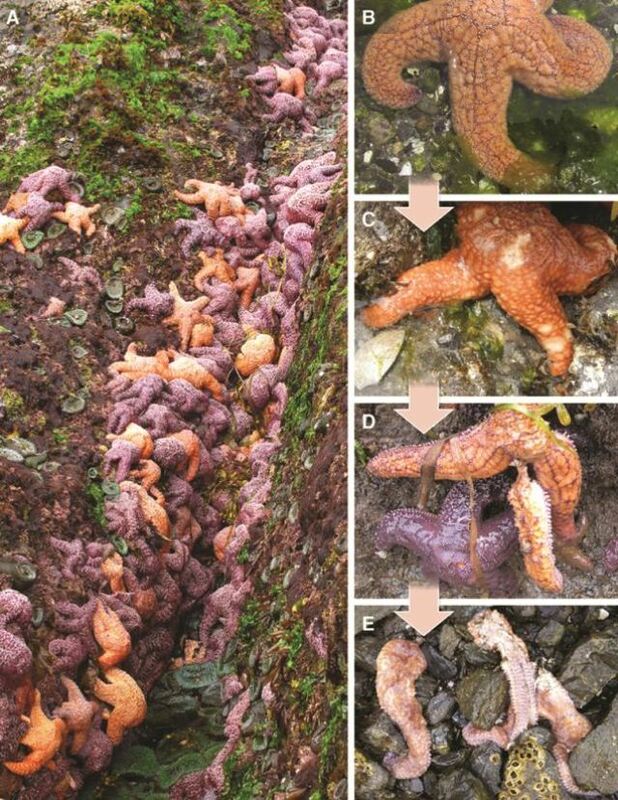 A second study provides the first evidence of a link between warmer ocean temperatures and impact of a West Coast epidemic of sea star wasting disease that has infected more than 20 species and devastated populations since 2013. These two papers, published Feb. 15, are part of a marine disease-themed special issue of the journal Philosophical Transactions of the Royal Society B. The issue – which contains a total of 13 studies – is edited by Kevin Lafferty, a marine ecologist at the University of California, Santa Barbara, and Eileen Hoffman, an oceanographer at Old Dominion University. The studies resulted from work done by members of the Cornell-based Ecology of Infectious Marine Diseases Research Coordination Network (RCN), funded by a five-year National Science Foundation (NSF) grant and seed money from Cornell's Atkinson Center for a Sustainable Future. One paper, “Improving marine disease surveillance through sea temperature monitoring, outlooks and projections,” summarizes all the cases where there are known links between disease outbreaks and temperature, including diseases that affect corals, turtles, lobsters, bivalves, starfish and eelgrasses. The paper proposes best practices to develop models that link disease risk with temperature. “We can say when these organisms are going to be at risk of disease outbreaks based on temperature projections,” said Drew Harvell, Cornell professor of ecology and evolutionary biology and a co-author of the study. Jeffrey Maynard, formerly a postdoctoral associate in Harvell’s lab, is co-first author along with Ruben van Hooidonk, an assistant scientist with the National Oceanic and Atmospheric Administration (NOAA) and Jeff Shields, professor of marine science at the Virginia Institute of Marine Science. While at Cornell, Maynard developed similar projection models linking coral disease with projected increases in sea temperature under climate change. In the current paper, Maynard and Shields developed new climate models that projected temperature levels likely to promote epizootic shell disease in Maine lobsters. The disease causes infection that degrades lobster shells. Advanced warning of the right conditions for disease allows marine managers to increase surveillance and implement preventive strategies, such as reducing pollution, boat traffic and transmission dangers, Harvell said. Another paper, “Ochre star mortality during the 2014 wasting disease epizootic: role of population size structure and temperature,” focused on ochre stars, the most abundant sea star species along the West Coast, and showed that warmer ocean temperatures lead to higher risk of infection from sea star wasting disease, an affliction that wiped out 90 percent of some populations from Mexico to Alaska between 2013 and 2014. Adult populations fell to one quarter of pre-outbreak numbers in the San Juan Islands, Washington. The study was led by co-first authors Morgan Eisenlord, a graduate student in Harvell’s lab, and Maya Groner, a postdoctoral fellow at the Virginia Institute of Marine Science. “The outbreak occurred during a period of anomalously warm sea water and stars in the San Juan Islands had a higher disease risk at warmer sites,” said Harvell, a senior author of the study. In lab experiments sea stars died faster from the wasting disease at warmer temperatures than infected stars in cooler water. While there is no cure for the disease, “not moving stars around is a key recommendation,” said Harvell. Future work should investigate whether survivors may have some natural resistance to the disease that might be exploited, she added.